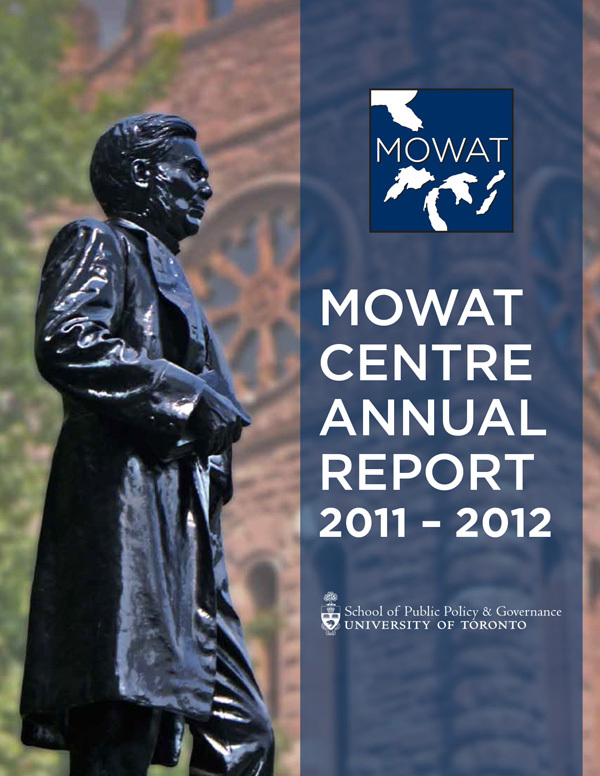 Mowat Centre’s first annual report for the year 2011-12 with updates on our year’s publications, events, staff and media presence. This report represents a milestone for the Mowat Centre. It is our first annual report and its production signifies a more mature phase of our existence. As Mowat completes its third year, we are focused on sustaining our reputation and consolidating our growth. We are moving from our initial start-up phase, where our focus was producing and communicating high quality applied public policy research, to the next stage of our organizational life. Within this new phase we will maintain our commitment to quality and impact while investing more time and resources toward the professionalization and development of our organization in a manner that will support our growth over the medium- and long-term. The past three years have laid a strong foundation on which to build. The next challenge for Mowat is to build on our organizational successes in order to ensure that we can withstand changes in leadership, personnel, governments and policy cycles – whenever they arise. We are happy with our early successes but recognize that our next goal will be even more challenging: cementing our reputation as one of Canada’s leading public policy research institutions, offering evidence-based policy solutions on national issues important to Ontario. At Mowat, we take great pride in the quality and timeliness of our work and are gratified by the reception it has received in many different communities and sectors. Our EI Task Force, the culmination of over a year’s worth of consultation and research, released its final recommendations in November 2011. Following on the heels of our report, the federal government introduced changes to the EI program and these changes have ensured a continued focus on the Task Force’s work and recommendations. Ultimately, the federal government took our advice on some small policy matters, but left unaddressed the major structural problems with the system that were identified in our report. We expect that this issue will continue to be a focus of public debate and further reforms will be forthcoming and the Mowat Centre will continue to deepen its expertise on issues relating to income security, unemployment insurance, labour market training and the unique ways these play out in different regions across the country. Our research on voter equality has had an even greater impact on policy debate, with many of our recommendations finding their way into new federal legislation. The work from the Mowat team has had a measurable impact on Canada’s move toward representation-by-population, and as federally-appointed boundary commissions finalize new electoral maps in the coming months, Mowat will continue to track developments and provide expert commentary. Mowat’s core work will continue to include a focus on intergovernmental policies, Ontario’s place within the federation and Canada’s fiscal arrangements, including our work on Equalization. Our research has shown that the Equalization program was designed for a set of economic realities which no longer exist and we will continue to work toward a redesign of federal fiscal transfers to better respond to the Canada of today. It is also gratifying to note the positive reception to our work on government transformation. Our Shifting Gears series of research papers, supported by KPMG, is charting a path toward more effective and more cost-efficient public service delivery models. The core principle driving this research is that governments can deliver better public services for less money and we have been delighted to see various ministries take up many of our recommendations and help deliver savings to the government and the public. This series will continue next year. Our two independently funded research groups have added dynamism to our organization. Our Energy Policy hub has begun to release the results of its research, while our newly funded Not-for-Profit Policy hub has begun consultation with the not-for-profit sector and is working toward defining an ambitious, collaborative research agenda. Both groups have found a supportive home under the Mowat umbrella and the diversity of researchers who now call Mowat home has added to the creativity and professionalism of our research. In the coming months, Mowat’s growing maturity as an organization will be signaled in a number of ways. We will be releasing our first two books. The first will be a compilation of the research emerging from the EI Task Force, while the second will focus on Ontario’s emerging place in the Canadian federation and will compile the papers coming out of the State of the Federation conference, hosted by Mowat. We will also be incubating a new organization, the Great Lakes Regional Council. One of the primary outcomes of our Great Lakes Summit was a call for a new institution that convenes leaders from across sectors and across both sides of the border to work collaboratively on shared economic, environmental and social challenges. We are acting on this call to action. The new organization will be officially launched in April 2013. The focus of Mowat work will continue to be diverse, but an emerging theme influencing many of our upcoming projects will be the future of the Ontario economy. In addition to our follow-up work with the Ontario Chamber of Commerce on our Emerging Stronger report, our three new major projects will all look at aspects of the public policy landscape and their impact on Ontario’s economy: the future of the manufacturing sector, the role of diaspora networks in strengthening the economy, and the structure of corporate taxation. In these and other projects, we continue to broaden and deepen our partnerships across the province, country and globe. One of Mowat’s core beliefs is that research and recommendations are better when they are developed collaboratively and when they harness the knowledge of diverse constituencies and communities. This approach will continue to animate our work. Thank you for your ongoing interest in our work, and thank you to Mark Stabile and the School of Public Policy & Governance, Dean Meric Gertler of the Faculty of Arts and Science, and President David Naylor for continuing to provide the Mowat Centre with a supportive academic home base within the University of Toronto.